The thigh bone of a huge extinct mammal may have inspired a beast or two in classical mythology. 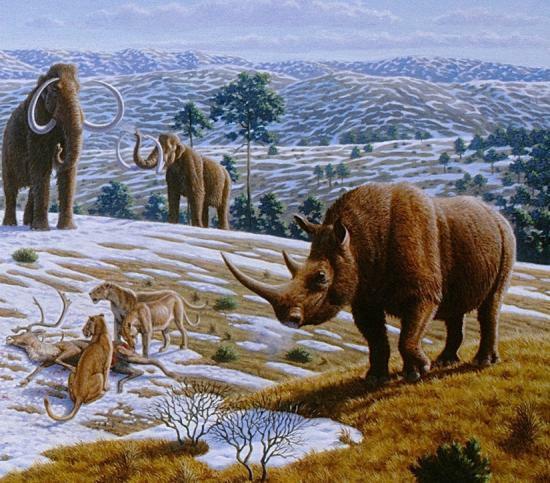 The thigh bone of a large, extinct mammal was originally collected by the ancient Greeks. It was rediscovered 40 years ago, but never went on permanent display. The fossil, which may have inspired certain beasts in Greek mythology, now has a permanent home in England. The bone of a large extinct creature, once treasured by the ancient Greeks, has finally found a permanent home in England. Known as the Nichoria bone, the blackened fossil is part of the thigh bone of an immense extinct mammal that roamed southern Greece perhaps a million years ago. The bone was collected by ancient Greeks and may have even help inspire certain beasts in Greek classical mythology. It was then then rediscovered 40 years ago. Since then the fossil had largely vanished from the public eye. "It was presumed lost until 1998. Following my inquiries, the fossil was found stored in a cellar at the University of Minnesota. It then spent last decade in various U.S. labs," Adrienne Mayor, a research scholar in Classics and History of Science at Stanford University, told Discovery News. The historic fossil has been welcomed by curators at the Ashmolean Museum in Oxford, England. "This venerable bone deserves to be displayed. It is one of only two large vertebrate fossils that were deliberately collected in antiquity and unearthed by archaeologists in Greece," Mayor said. Large fossil remains of prehistoric species, like this petrified thigh bone, might have been the inspiration for many legendary beasts of classical mythology, according to Mayor, who described the fossil for the first time in her 2000 book "The First Fossil Hunters." Uncovering the roots of several myths, the book, whose revised edition has been published this month, showed that prehistoric fossils exist in the very places where myths about giant beings arose. "Most likely, the ancient Greeks found the bone in the lignite deposits of the Megalopolis basin, known in antiquity as the 'Battleground of the Giants.' There, the dense concentration of large fossil bones inspired the belief that entire armies of giants were blasted by Zeus's thunderbolts," Mayor told Discovery News. Perhaps revered as the thigh bone of a mythic giant, the Nichoria bone was discovered on the ancient acropolis at Nichoria between 1969 and 1975 by archaeologists of the Minnesota Messenia Expedition. The fact that it was carefully stored on the acropolis, which stood some 35 miles from the lignite deposits where the bone was probably found, shows that the ancient Greeks had a great interest in fossils. "The bone provides further confirmation that the ancient Greeks already found such specimens and ascribed special significance to them," Hans-Dieter Sues, senior scientist and curator of vertebrate paleontology at the Smithsonian's National Museum of Natural History in Washington, D.C., told Discovery News. Identified in 1978 as the femur of a "Pliocene elephant," the bone was lost for two decades. Rediscovered in 1998 in the Archaeometry Laboratory of the University of Minnesota, Duluth, it remained uncatalogued until Mayor recognized its significance. She took the fossil to the American Museum of Natural History in New York, where it was examined by paleontologist Nikos Solounias, an expert in Greek fossils of the Miocene to Holocene epochs. Solounias identified the bone as the distal end of the femur of a woolly rhinoceros, or possibly a Chalicotherium, a large herbivore, and dated it to the Pleistocene era (2 million to 10,000 years ago). According to Solounias, the rusty-black color of the fossil bone indicates that it was most likely collected from the lignite deposits near the ancient town of Megalopolis. Carried by the ancient Greeks to the sunny acropolis of Nichoria, and then unearthed two millennia later, the bone traveled extensively in the last decade. From Greece, across the Mediterranean and Atlantic, it went to Minnesota, then east to Princeton, New Jersey and New York City to be identified by paleontologists. Then west again to Bozeman, Montana, where it was professionally stabilized by restorers at the Museum of the Rockies, to prevent further breakage. "It was then transported overland to Palo Alto, Calif., where it rested on my desk, as I searched for a proper home in a leading museum," Mayor said. This spring, the relic traveled back over the Atlantic, from California to its final home at the Ashmolean Museum in Oxford, where it will be displayed in the Greek and Roman Antiquities Gallery.